The two following "Owls" were taught to me by Zah Tso and her sister, Navahos from Gallup, New Mexico, at the St. Louis Exposition, in November, 1904. 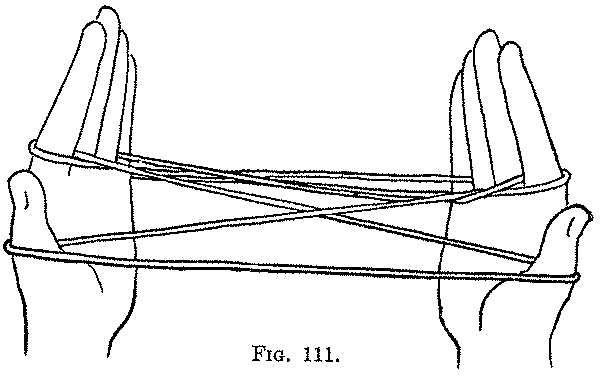 Second: Bend each index down between the far index string and the near little finger string, and bring it toward you and up between the near index string and the far thumb string (Fig. 111). 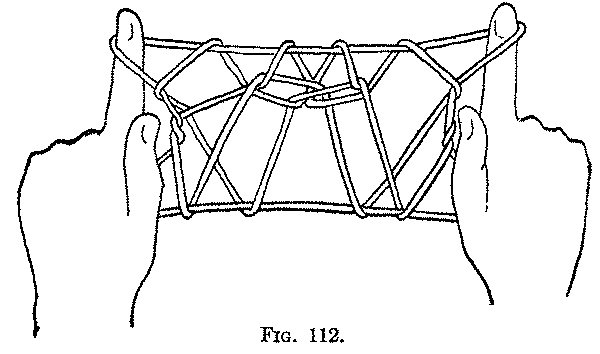 The index loop, which has been kept on the finger during this movement, is thereby given a single twist. Third: Complete the figure by doing the Second, Third, Fourth, Fifth, Sixth and Seventh movements of "Many Stars" (Fig. 112). The movements of this figure are similar to those of "Many Stars," except for the additional Second movement which puts a twist in the index loops.